Martha Stewart is an undeniable force in the business world. One of the world's greatest entrepreneurs, she turned her personal passion into Martha Stewart Living Omnimedia, a billion dollar business. This Fall she's breaking new ground with two television shows from NBC - her reality show The Apprentice: Martha Stewart and her daytime syndicated show Martha - as well as a radio program on Sirius satellite radio which will provide daily round-the-clock how-to content. What's her secret for success? Now, for the first time, Martha Stewart shares her business knowledge and advice in this handbook for success. Tapping into her years of experience in building a thriving business, Martha will help readers identify their own entrepreneurial voice and channel their skills and passions into a successful business venture. Her advice and insight is applicable to anyone who is about to start or expand a venture of any size, whether it is a business or philanthropic endeavor, but also to individuals who want to apply the entrepreneurial spirit to a job or corporation to increase innovation and maintain a competitive edge. 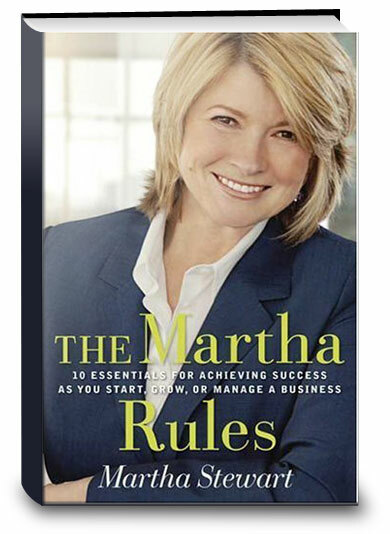 Featuring Martha's top principles for success, as well as stories and anecdotes from her own experiences, The Martha Rules is sure to appeal to business readers, fans, and anyone who admires her for her style, taste, and great advice-and who have great business ideas of their own! Click the button below to add the The Martha Rules: 10 Essentials for Achieving Success as You Start, Grow, or Manage a Business to your wish list.